Accommodation of participants is organized by the Ettore Majorana Foundation either in the EMCSC premises or in local hotels on the basis of the indications provided by the Organizing Committee and by participants in the Travel Form. Special requests should be addressed to the School Scientific Secretary, school_fpricci@its.me.cnr.it. 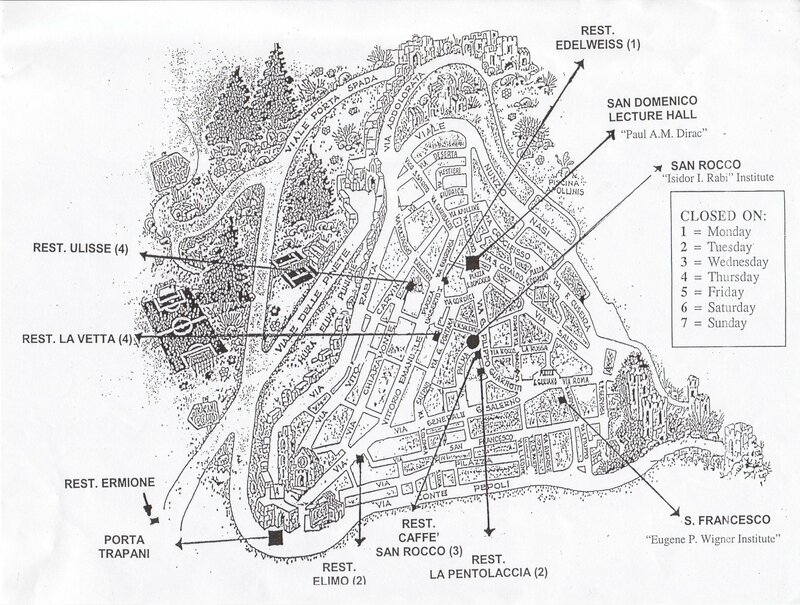 The locations of all housing facilities (Centre, Institutes, and Hotels) are shown on the Erice map, included in the documents you will receive upon registration. There is a “coffee room” in the I.I. Rabi Institute where coffee, tea, mineral water and snacks are available at any time. This “coffee room” is also used for breakfast. There is a “piano room” with a keg of complimentary Marsala wine. This “piano room” can also be used for working parties. The “piano room” will close at midnight. A computer room is available at the I.I. Rabi Institute. Breakfast is served at San Rocco coffee area to all participants accommodated in the EMCSC premises, whereas participants in hotels may have their breakfast there or at San Rocco. Restaurants. At the restaurants associated with EMSCS meals are free – you just have to show your badge and sign a list provided by the restaurant. Beverages and meals not included in the EMCSC menu are extras and should be paid for. The choice among the associated restaurants is absolutely free. Thus, if you need a special food (vegetarian, kosher, etc.) you should negotiate directly with the restaurant (the EMSCS secretary will be glad to offer his assistance). Coffee, tea, sandwiches, fresh fruits, mineral water, and Sicilian sweets are freely available 24 hours in the San Rocco coffee area and in the coffee-break area at San Domenico.